This makeover from Rian Hughes is shown here. His website is well worth checking out. Hat tip to John Wick. Titles matter. This article analyzes what titles of scientific articles get social media buzz. Funny titles don’t help. But making positive, definite statements about the results does. These data support the Columbo principle for writing titles: Show the murder. Make the audience wonder, “How can you prove it?” instead of “Whodunnit?” Hat tip to Neuroskeptic. Giving the only drink tickets to the students to hand out during poster presentations is a brilliant move. Terms like eg, ie and etc, while common, make reading difficult for some. Nature has an article looking at biological visualizations. 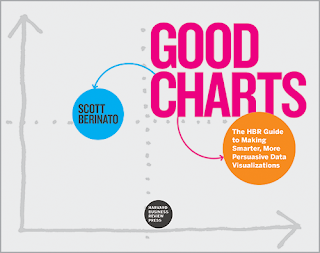 Scott Barinato’s new book is called Good Charts. Nancy Duarte interviews him here. My theory is that everyone is basically confused at what to wear for conferences and so the end result is a mish-mash of different levels of smartness.